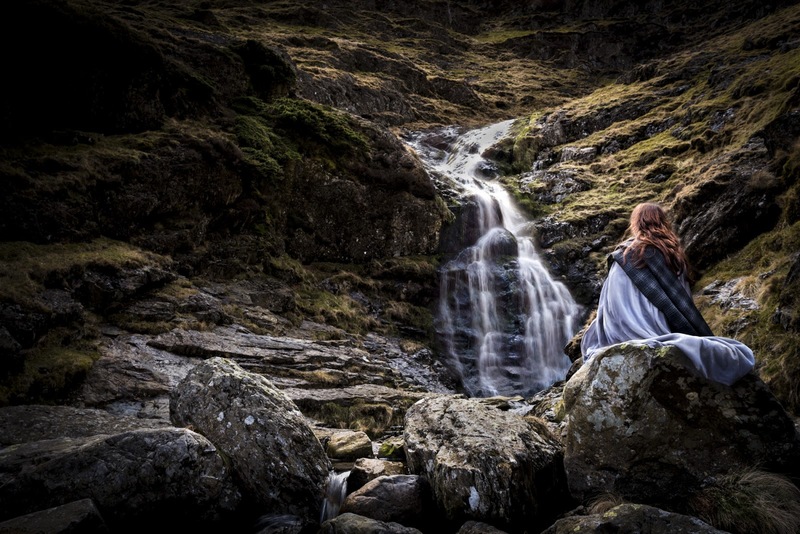 Given the traumas I went through searching the Lake District- on line and on foot- for the waterfall which exactly fitted Kathleen's description of the magical meeting place of Taniu and Owain, the choice was eventually easy. He looked up and saw a figure in a grey gown, gold hair streaming across its shoulders, watching him with wide grey eyes. It was as if sunlight, clear stream and grey stone had shaped themselves into a girl. He had the wild thought that the Goddess herself, the Lady of the hill circles and the holy springs, had risen from the stream to his aid. It is so near a perpendicular that it would have appeared to fall--but it is indeed so fearfully savage, & black, & jagged, that it tears the flood to pieces--and one great black Outjutment divides the water, & overbrows & keeps uncovered a long slip of jagged black Rock beneath, which gives a marked character to the whole force. What a sight it is to look down on such a Cataract! The photo shoot went well- apart from Ian getting wet feet and Kathryn a cold bottom, and eventually the sun came out and the Raven cawed us his blessing. In fact the sun became so insistent that Ian tried using the old umbrella from the boot of my car to defeat the flare. The struggle to control it and the camera landed him in the beck! Ian is a perfectionist. He would happily do the whole shoot again, but time is pressing and I am delighted with his final photograph. Should we see a little of Kathryn's face, or does the back view leave us more intrigued? I know that there is some evidence of plaid/check weaving in sixth- century Britain, and visually, I like the way the dark check works with the light grey flowing cloak which echoes the water, but I worry that it looks too modern. Opinions please? Should we tidy the hair? We will certainly lighten it to a reddish gold. Does the image convey a sense of mystery? Could Owain seeing this imagine that sunlight, clear stream and grey stone had shaped themselves into a girl? And finally, the Leibster Award! I am extremely honoured by being nominated for this award not once, not twice, but three times- something almost magical there! I have been so swamped with work since that I haven't written a post for well over a month, and so felt I really didn't deserve it. However, now that I've written this one, and now that the cover of Bride of the Spear is well on its way, I am ready to tackle my Liebster post, so thank you Kathryn Warner, Carla Nayland and Beth- my next post will honour you! OK I shall have a go; Hiding the face adds mystery. If anything I would have expected her looking up more? The clothes colour scheme matches the idea that she has been formed by the rock. The fabric would have been more rough spun and the shade seems too strong but it is not a big issue to me. And I prefer the hair untidy because this is the wild she has walked too. The left is dark, I assume this is the space for the font and they will be a light colour for clarity? Thanks for that Rach- it seems we are going in the right direction.I've just had a similar comment from a visitoer to the house on my printed mock-up. You're in with a chance for a free copy! rather like happens with Owain. Having said that, the current photo shows Taniu's stillness and contemplative nature very well. The plaid did make me think of Scotland when I first saw it, but since Taniu is a Gododdin girl, perhaps that's appropriate! I think it could work without it, but like you I like the effect it has. Thanks for your thoughtful comments Beth. My daughter, who is also Trifolium Books' graphic designer, would like to see some of Kathryn's face as she feels it would help readers to connect with her. You are on the list for a possible prize copy- and I am looking forward to writing my Liebster post too! I am posting here Theresa Thomlinson's comment, as she wasn't able to post to the blog. (What are you doing Blogger?) Theresa wrote: "Couldn't manage to get into the blog! Loved the waterfall, the figure turned away, the hair - thought you might cut in more to focus on the figure and the waterfall. I think it's important to test how it will look on a thumbnail nowadays - clear and simple. All best with it Connie!" Glad you found the right waterfall! I would leave the hair as is; Taniu has spent the day riding across the moors and searching for wild plants, so she would naturally be a bit wind-blown. Also, one of the reasons that Owain quickly realises she is a real girl and not a supernatural apparition is that 'her gown was muddy', and windblown hair would fit with that. I like the plaid. Taniu is from Lothian which is now in southern Scotland, so the Scottish connotations of plaid fit reasonably well, and it contrasts nicely with the dress. I personally prefer not to be able to see the face, because that allows the reader to build their own picture of Taniu's features as the story unfolds. Thank you Carla- I too like the sense of mystery conveyed by the back view. I'm pleased that most of the comments we are getting- both on and off-line, suggest that we are getting the design right. I was horrified by a comment from one of our reading group that she thought the cover of Moon in Leo suggested that it was light-weight, girly, romantic fiction! Apparently the quotation 'Love is never lost, never wasted, never dies' was a major contributor to this impression. I had always assumed that it would convey the sense of universal, almost platonic love that Adam Halistan meant when he said it. Certainly the comments from that group of readers made me wish I had asked questions before publication, as I am doing now! I can see where she is coming from with the quote. When Adam Halistan says it, it's reasonably clear that he meant any kind of love, including but not limited to romantic love. By itself on the cover of a book, though, the reader obviously doesn't know the context and could easily assume that it refers to romantic love (especially as romantic love is the subject of a lot of fiction, so I suppose statistically it's a fair guess). The pink colouring may have added to the 'girly' impression as well - of course it's the natural colour of a gorgeous sunset over the sands, and the photograph is beautiful (I rather envy it....), but pink has become almost a uniform for chick-lit, so I suppose that could send the wrong signal. What did your reader think of Moon In Leo when she read it? I imagine it wasn't quite what she thought the cover was suggesting! If you're planning to post something about the reading group discussion, I'll be very interested in it. Do you find that different people react differently to different images and colours and shapes, depending on what they associate the image with? E.g. my first thought on the Moon In Leo cover was, 'What a gorgeous sunset and what a beautiful landscape!' and I didn't really notice the pink until just now when you mentioned the reader who thought the cover looked 'girly', and I glanced across at the book on my shelf and realised how pink it is. But that's probably because mountain and seascapes attract me, so that's the aspect I noticed most. If anything, I'd assume the Bride of the Spear cover to imply a stronger romance element than Moon In Leo, because of the figure of the girl centre-stage.